We awoke to very warm and calm conditions on Thursday morning and were happy to also find many of the sportfish boats had departed for the fishing grounds. The resultant decrease in electrical demand on the docks finally gave us enough voltage at the dock’s power pedestal to hook into shore power, charge the batteries and even run one of our A/C units. Sadly this was also the day that Dan and Juli were to fly back to Florida. We’d had a fabulous time together, but certainly understood they had obligations back home, and a brand new boat of their own waiting for them upon return. We said our good-byes late morning and they cabbed it over to the airport. 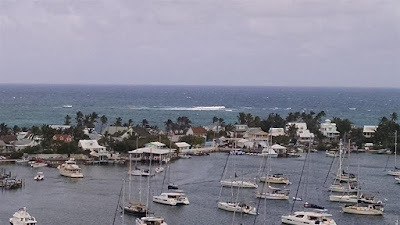 Shortly after that we got back underway, cutting our stay at Marsh Harbor by a day, and pointed Ghost Rider back to the east towards Elbow Cay and Hope Town. We timed the arrival pretty well, arriving just after high tide around noon. That gave us just enough water under the keel coming into the harbor’s shallow entrance channel and enter the large – but crowded – mooring field where there were better depths. We found an empty mooring ball (actually two green floats attached to the bottom), grabbed its two pennants (tether lines) with the boat hook and attached them to our forward cleats. Later we discovered the two pennants were badly twisted around each other just below the surface and had to spend some time removing and unwinding them to give us a better “fit” that didn’t involve chafing against Ghost Rider’s bulbous bow. 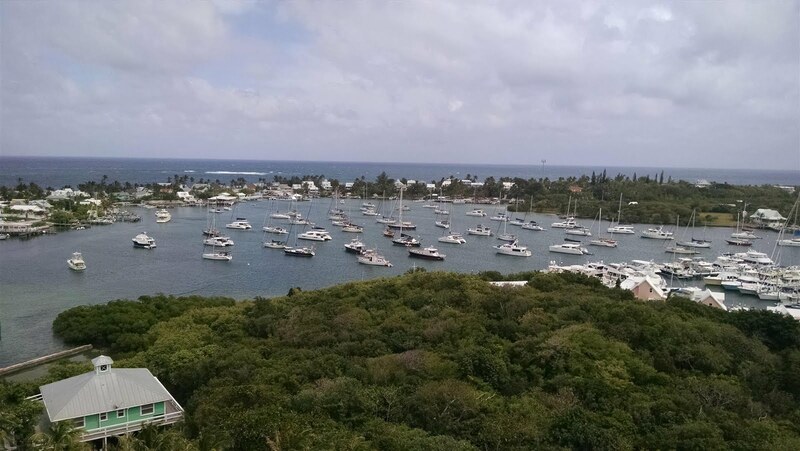 It also took us a while to get accustomed to how close together the boats get here in this mooring field – very different from anchoring where you generally get to pick how close or far you’ll be from other vessels. Rick measured 75 feet from the two boats nearest us….enough swing room for our 50 foot length as long as nobody drags. But we would not bring a bigger boat in here. 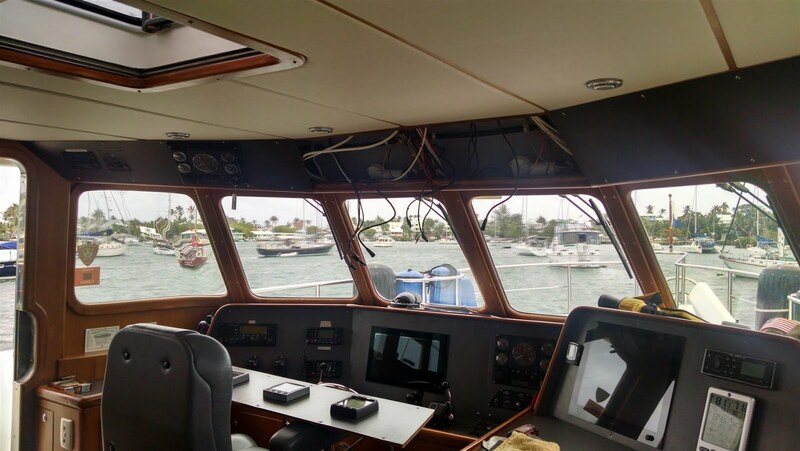 We launched the tender later in the afternoon and Chelle took it for a spin to make an initial scouting of the harbor area, while Rick tended to some minor boat business and rested a badly pulled back muscle suffered during the mooring line untangling. But we had a peaceful evening and overnight. We had decided that the first half of this day would be dedicated to “boat business”; our Wheelhouse maintenance program had accumulated about eleven overdue items that we wanted to knock out before exploring the island. There were a handful of minor checks (strainers, thrusters and the like) along with changing out both filters on the water maker. 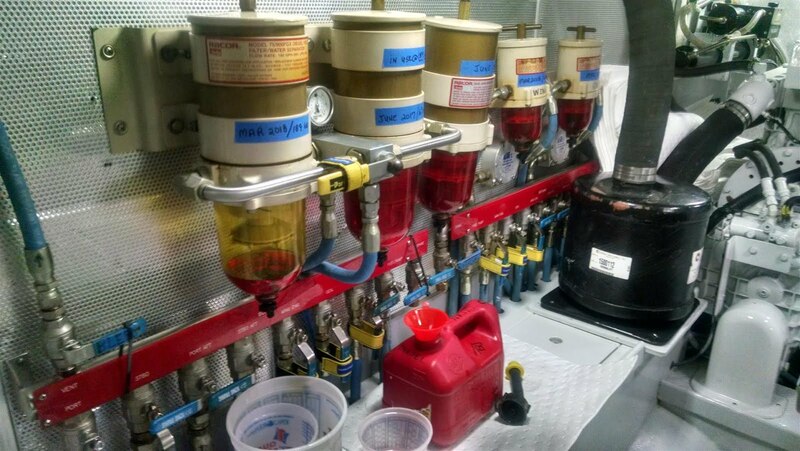 While Rick worked on those Chelle gave the tender some much needed cleaning and waxing attention, and we also got some laundry done and topped off our water tanks. Unfortunately by the time we completed our day’s assignments the weather turned for the worse a little earlier than predicted. Showers and storms started popping in the area as a cold front reached down and then just stalled. 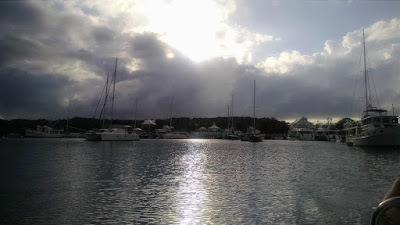 So we hung out on the boat the remainder of the afternoon until we found a pause in the weather that looked decent enough to take the tender over to the Hope Town Harbour Lodge restaurant. 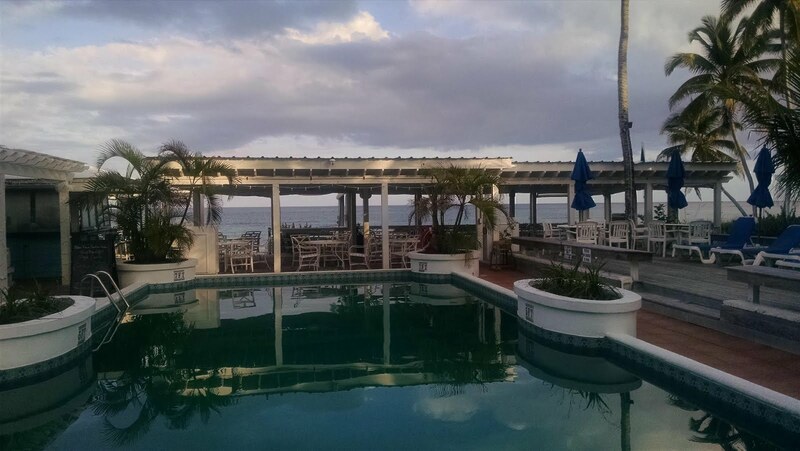 It’s one of the more upscale eateries on this end of the island, and the food (Mahi and a seafood medley) were quite good, as were the rum punches. By this time we had also figured out some of the local customs. The islanders here are known to be a fairly spiritual community, so church bells ring at frequent intervals. At each sunset you will hear both locals and some boaters blow their conch shells in an uneven sounding ritual (some are good at it, some not so much.) And they certainly have their own varied definition of “island time”….you can take your trash to shore only once per week during a one hour period; and if you need to mail anything it’s worth knowing the post office (co-located with the police station) is only open Wednesday and Friday from 0930 to 1445; and you cannot rely on the light house lantern being lighted up when you might expect that...it certainly isn't at sunset or even at full darkness, but eventually somebody gets up there and lights the torch. 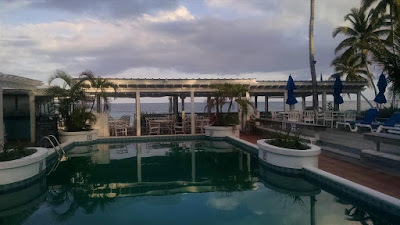 The next day (Sat, 21-Apr) brought overcast skies and intermittent rain showers with brisk winds, so the morning was a good time to attack one more significant maintenance task. Over the past couple of days a slow leak had developed from one of the main engine’s two Racor fuel filter assemblies at its drain plug. No amount of adjusting the seeping drain had any impact on it. So we decided to empty and disassemble the unit for a closer look. This is one of the older Racor designs, with a two piece plastic drain – quite susceptible to cross-threading which inevitably leads to leaks. Once removed a close inspection revealed this one was essentially shot; over the years it had been mangled and overtightened, which crushed the internal gasket for the drain orifice and stripped the plastic threads. We did not have a spare, so for a temporary workaround Rick used JB Water-Weld to plug the two holes at the drain valve’s entry and exit points, and then applied Permatex #2 sealant on the mangled plastic threads. (No boat should leave the dock without those products onboard.) We let all that stuff cure for five hours before refilling and leak-testing…and it seemed to be holding for now, hopefully at least minimizing the leak until we get back to the States and obtain a functioning replacement The bowl can still be drained if needed by loosening the larger drain receptacle, albeit with more of a mess. While the Racor repair was curing we took off in the dingy to tour more of the local sights. 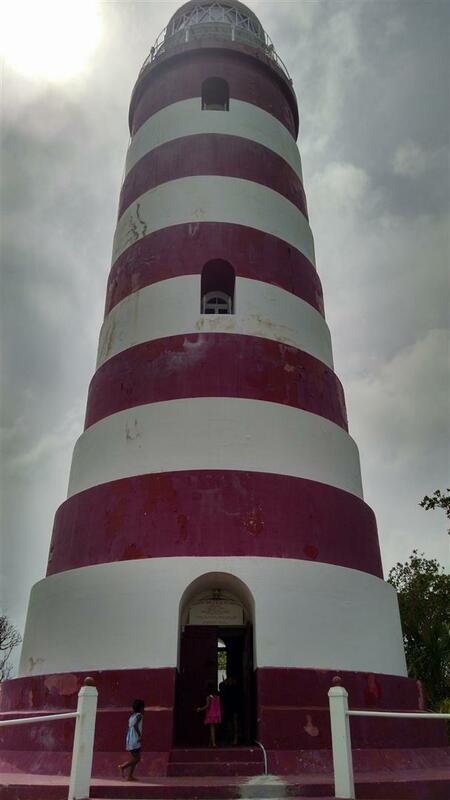 First stop today was the Elbow Reef Lighthouse, which is advertised as the last manned kerosene-fired lighthouse still operational on the planet. Built in 1864 and standing at 120 feet above sea level, its lamp puts out 325,000 candlepower, making it visible up to a range of 17 miles. You can climb the stairs to the top (101 steps) and the view from up there is spectacular. Next we took the dinghy on another side of the harbor to have a late lunch at Harbour’s Edge (we tried Cap’n Jack’s first, but turns out that place is closed on weekends….more “island time” lessons.) 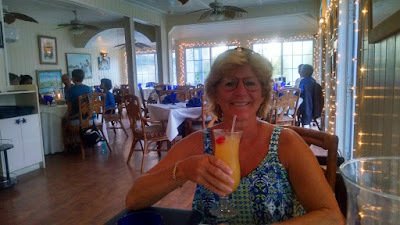 But Harbour’s Edge was just fine, with excellent Caribbean Quesadillas and more tasty varieties of fruity rum drinks. By the time we made our next intended stop at the local museum it was closed. We’ll hit that on another day, and besides another band of rain showers were moving in, so we boogied back to the boat. We concluded the day by making up our own version of the Goombay Smash – three different rums (generously) with orange and pineapple juice (in moderation.) It was excellent. We’ve named it the “Goombay Ghost”, as it will haunt you if you have one too many. Early on Sunday morning, 22-Apr, (around 0300) thunderstorms started popping consistent with the forecast. We closed up the few portals we had open and verified we weren’t dragging in the gusty winds. The storm cells had died off by sunrise, but we had discovered a rain water leak in the pilot house, leading Rick to conduct an examination of the various things mounted on the roof above. Based on the location of the drips the first suspect was the flush mount Furuno GPS which had to be disassembled to inspect its cable run. The original caulking around its comm cable hole was deteriorating with some gaps, and there was evidence of water seepage and corrosion on its connecting pins. Rick dried it out, removed the old caulk, cleaned the connectors with CRC electrical spray, then resealed it all with his favorite Rescue Bond XL1 caulk. Since the repair work on the antenna was a one-person job, Chelle took advantage of the same break in the weather to dinghy ashore and relax with some beach time. The winds were still clocking making snorkeling unattractive, but she was fortunate to get a couple hours of sunning time. By the time she returned to the boat Rick was finishing up his repair, and then the rain moved in again. Shortly after midnight the rain became a torrid downpour….and we still had a leak in the pilot house. Rick removed the instrument panel to keep it dry, disconnecting all the instrument wiring, and placed a bucket under the rapid drip as an overnight stall tactic. The next morning, Monday, 23-Apr, Rick was back on the pilot house roof disassembling the search light. At this point we were pretty sure that was the leaky culprit, so once again Rick went through a remove-and-recaulk exercise. This one took several hours as it was apparent someone else had previously attempted the same thing, and there were several old screw holes up there that also required sealing. 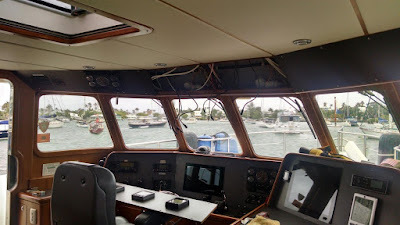 We left the pilot house panel in its disassembled state so we could better judge how effective all that was during the next set of rain showers – which were definitely still in the forecast. 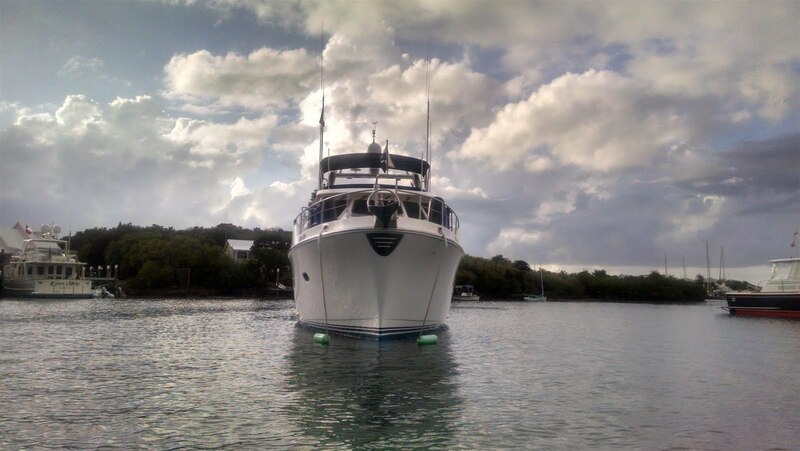 That same day our 12KW diesel generator reached bingo hours for its next oil change (every 200 hours, which doesn’t take long when you’re island hopping on the hook), so we tackled that in the afternoon as well. By 1730 we halted the boat business work and relaxed the remainder of the evening. On the morning of Tuesday, 24-Apr, we awoke to more rain showers as yet another squall line moved in from the west. The good news was that our pilot house roof patches had reduced the rain water leak to a very occasional drip…it would have to do until we got back to the States for some professional FRP work to create a new base for the search light mount. The bad news this morning was the generator wouldn’t crank; that turned out to be a poor battery connection at the starter solenoid which was a quick fix. That was a good thing since we were boat-bound until / unless the weather moderated, and it was warm and muggy with the boat closed up against the rain – the air conditioning felt good. By early afternoon rain was still falling with more storm cells on the horizon; the forecast kept changing, and not for the better. 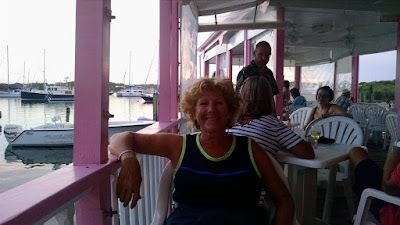 We gave up on island touring, and Chelle caught a ride on the ferry over to Marsh Harbor for some fresh food shopping while Rick tended to a few more minor chores and then relaxed with a book. Shortly thereafter the rain stopped and the skies cleared – so much for the meteorology around here. Rick went up to the boat deck with his book for some much-needed sun and chill out time. 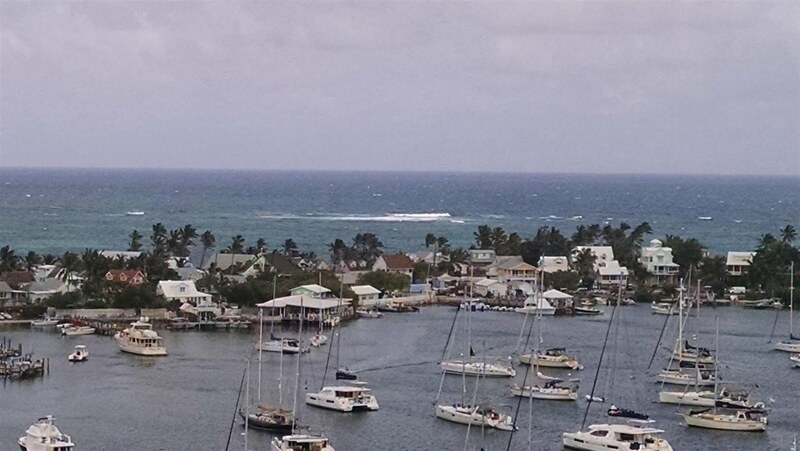 Chelle returned from her ferry ride and market run – with lots of fresh fish and some rum refills – around 1700. And then the clouds moved in yet again, with radar showing more storms on the move and headed our way. This was getting old. But we bet we could dinghy over to Cap’n Jack’s for dinner and make it back before that next line of weather arrived, and it turned out we were correct. And the seafood and salad (and rum drinks) were quite good. Just before 2200 the rain started again and we called it a night. 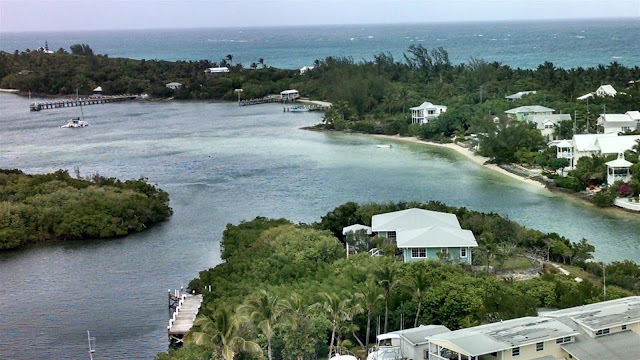 Tomorrow our plan is to head south a few miles to the Tahiti Beach anchorage, but will have to wait for a late afternoon high tide and a break in the weather to make that move.